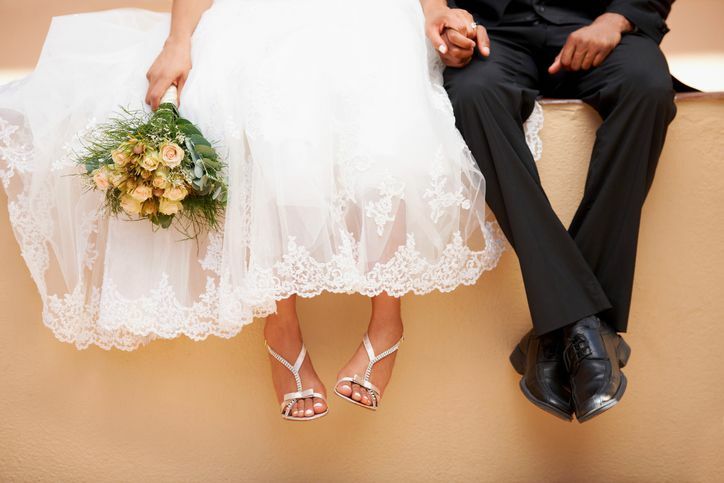 When it’s time to compile a wedding registry, or it’s time to shop for someone who’s getting married, the options can be overwhelming. There are so many things a couple might need that they've never owned before, and it is also the perfect time to upgrade from the hand-me-downs, thrift shop finds, and budget appliances. Now is the time to look for quality products that will look good, last a long time, and make cooking easier. Every cook is different, so not all of these items will be a fit for every registry. And some couples will have an even longer list, depending on what they like to cook, but this list is a good starting place. A set of cookware is essential, and good-quality cookware is less likely to have hotspots where food could stick or burn leading you to ruin your meal. 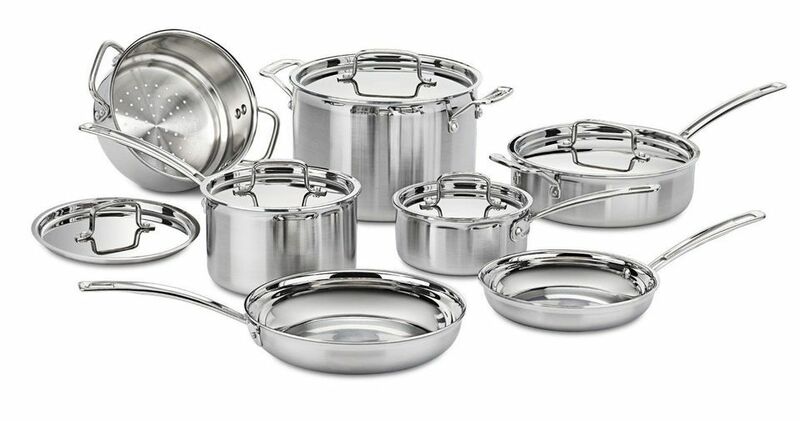 This attractive stainless steel set has just about every piece needed, and will last a lifetime. While this doesn’t include a nonstick frying pan for cooking eggs, it does include a stockpot with a steamer insert which many other sets leave out. These pieces are oven-safe to 550 degrees Fahrenheit, so you can start cooking on the stove and finish in the oven. Plus, they are dishwasher safe for easy cleaning. Need some more help finding what you're looking for? Read through our best cookware sets​ article. Stand mixers are becoming more and more popular, and for good reason. This mixer is strong enough to mix batters and doughs for any baking projects, from cakes to cookies to homemade bread. You can use it to whip cream or make meringue, and you can use it to shred cooked chicken for tacos. To make the mixer even more useful, there are optional attachments for shredding, slicing, making pasta, making ice cream, spiralizing vegetables, grinding meat, and more. Need some more help finding what you're looking for? Read through our best stand mixers article. Pressure cookers have been around for a long time, but early technology made them less-than-appealing. This electric pressure cooker has taken the technology to a whole new level, with safety features that make it quite safe, and a timer that doesn’t leave you guessing. This new version of the Instant Pot, introduced for 2017, has added buttons for features that users talked about the most, like eggs and cake. It can pressure cook for up to 24 hours, delay cooking for 24 hours, or keep food warm for up to 10 hours. For cooks who don’t want to be disturbed when the food is done, you can set it to silent mode. Besides cake and egg settings, this also has presets for soup/broth. meat/stew, sauté, rice, multigrain, porridge, steam, and slow cook. There’s also a manual mode. This cooks only at high pressure; it does not have a low pressure setting. The inner pot is stainless steel for easy cleaning in the dishwasher. Need some more help finding what you're looking for? Read through our best pressure cookers article. Busy newlyweds will love this grill and griddle for making pressed sandwiches, grilling steaks or burgers, or making pancakes and bacon for breakfast. The brushed stainless steel housing looks attractive and is easy to clean, and the floating hinge adjusts for different food thicknesses when it’s used in the closed position. Open the Griddler completely and you’ve got a flat grill or griddle with plenty of space to cook on. The included cooking plates are reversible for grill or griddle cooking and are designed to drain grease into the integrated drip tray. The selector knob lets you choose grill or griddle functions and each has adjustable temperature controls. Red and green indicator lights let you see at a glance that the cooking temperature has been reached. For even more versatility, waffle plates are available for purchase separately. Need some more help finding what you're looking for? Read through our best griddles article. Everyone needs a good set of knives, and this set has everything you need, along with an attractive knife block to store everything. Even better, the block has a self-sharpening feature for all of the straight-edged knives, so you won’t need a separate sharpener to keep your knives in great condition. This set includes a 4 1/2" paring knife, a 6" utility knife, a 6" serrated utility knife, a 7" santoku, an 8" chef’s knife, kitchen shears, eight steak knives, and the knife block. Flatware is a must for a new home, and this set is elegant, attractive, and functional. The streamlined design will coordinate with just about any dishes. This set was also designed to be ergonomic, so they’re great for those with arthritis or other hand-related issues. But the smooth lines are aesthetically pleasing as well. These are heavy utensils that won’t bend, and will last a lifetime. They are dishwasher safe. Need some more help finding what you're looking for? Read through our best flatware sets article. Blenders are great for everything from milkshakes to blended cocktails to morning smoothies, and this one can do it all, with 1100 watts of power, three speeds, and pulse and single-serve functions. For morning smoothies on the go, this comes with a pair of 16-ounce travel cups with lids, so it’s simple to make two different smoothies without needing to clean a big container in between recipes. When it comes to big jobs, this has a 72-ounce container for a party’s worth of margaritas. The blades blast through ice and blend fruits and vegetables easily. When it’s time to clean up, all the parts are dishwasher safe. Need some more help finding what you're looking for? Read through our best blenders article. This toaster makes more than toast. It can be used as a small oven for times when heating up the large oven doesn’t make sense—perfect for reheating a slice of leftover pizza or even baking a small batch of cookies. It's large enough to fit a Dutch oven, and it can be set to “slow cook” to gently cook foods for a long time at a lower temperature. It has a fan for convection cooking and uses a technology called Element IQ, which is a smart cooking function that regulates time and temperature for baking and roasting. Need some more help finding what you're looking for? Read through our best toaster ovens article. Juicing has moved from trendy to mainstream with recipes that range from super-healthy to just plain fun. Besides making beverages, juicers can be used to process homegrown or farmer’s market tomatoes to make tomato sauce, and the leftover pulp can be added to muffins, soup stock, or other recipes. This juice fountain is heavy duty and compact and has a centered knife blade assembly that makes quick work of everything from soft fruits to crunchy carrots. The 700-watt motor runs at 14,000 RPM for great extraction. A safety arm ensures that the juicer won’t run unless the cover is properly in place. This has a large feed tube so you won’t need to cut food into tiny bits before juicing, while the micro-mesh filter catches seeds and other tough bits. A cleaning brush is included for hand washing, or clean the washable parts in the dishwasher. Need some more help finding what you're looking for? Read through our best juicers article. If ice cream is a passion, this is the appliance that will make it easy to make batches of any flavor at any time. It has its own compressor, so it’s ready whenever you are—no need to freeze a bowl the night before you want to make your ice cream, and you can make as many batches in a row as you want to. A bell chimes when it’s time to add extra ingredients, and it plays a tune when the ice cream is ready. You can set this for softer or harder ice creams, and it has keep-cold feature if you can’t remove the ice cream from the machine as soon as it is finished. Need some more help finding what you're looking for? Read through our best ice cream makers article. This soda maker is perfect for making plain sparkling water or flavored sodas whenever you want. No need to lug home heavy bottles and cans, and no need stock a lot of different flavors, just stock smaller bottles of flavoring to make soda any time you like—there are even flavors that are similar to commercial products. The starter kit comes with a small container of CO2 that makes the bubbles, but larger containers that make more soda per canister are available. Need some more help finding what you're looking for? Read through our best soda makers article.